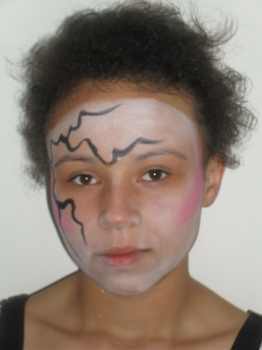 The coolest doll face painting ideas are here for you to look at also get some free face painting ideas. I'm sure I don't have to tell you how much FUN kids have with these kind of toddler activities. The easy step by step face painting pictures with easy face painting instructions below show you how to create this interesting face painting design for yourself. 1. to start cover the face in a very light white base coat as in the picture. Then add some pink paint to the high cheek bones. Now blend in the pink paint using a face painting sponge. 2. 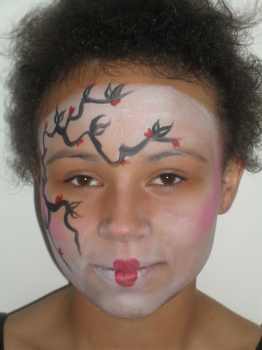 Next using black paint create a tree with branches starting from one side of the face. See the picture to get the idea. 3. next using the black paint create some little leaves on the branches. Then using red paint create some little flowers on the tree dotted about as in the picture here. Finally using the red paint create some small lips. If your looking for more face painting ideas then this video below shows you how to face paint a doll.